The influence of Cr2O3 and basicity on the viscosity of CaO–SiO2-15 wt% Al2O3-9 wt% MgO-22 wt% TiO2–Cr2O3 slag was investigated in the temperature range of 1673–1773 K. The viscosity decreased with increasing basicity at fixed content of Cr2O3 due to the depolymerization of silicon structure. At a fixed content of basicity, the viscosity decreased with increasing Cr2O3 when the mass percentage of Cr2O3 was below 1%. Different models were also used to predict the effect of Cr2O3 on the viscosity of blast furnace slag, and the results show that the optical basicity model agrees well with the experimental values. 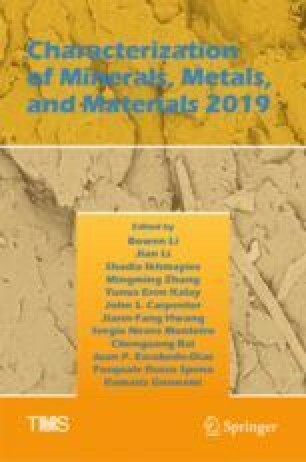 With the initial addition of Cr2O3 content, the slag melting temperature increased from 1660 to 1673 K. When the basicity increased from 1.0 to 1.2, the slag melting temperature increased from 1655 to 1720 K.
The work described in this paper was supported by a grant from the Natural Science Foundation of China (Project no. 51674055).